Thank You to The Designer Dachshund for this lovely article. I was kindly contacted by the lovely people at Guru asking if we’d be interested in trying some of their products, I’d seen their brand on Instagram and had read that their food was cold pressed which I’d never tried before so jumped at the chance! One of the first things I noticed was their gorgeous packaging – I absolutely love the colours they use which would instantly grab my attention in a pet shop! It is decorative without being over the top and easy to ready which is super helpful. The next thing we where sent was a very decent sized sample of their Surf and Turf cold pressed dog food. 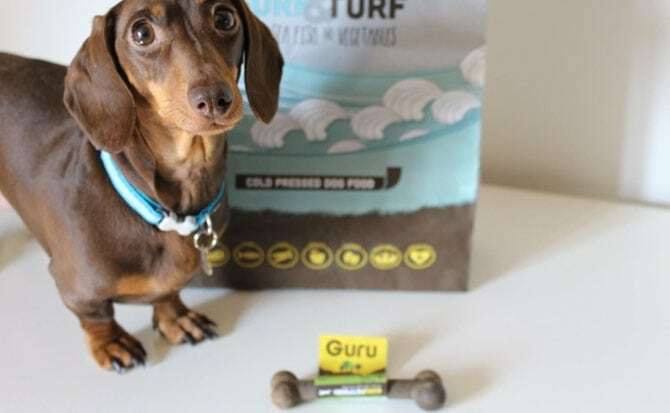 Anyone that knows me will know that I can spend hours taking about and researching dog foods as I’m incredibly fussy about what the dachshunds can have and Guru only contains high quality ingredients including Beef, Ocean fish, Green Lipped Muscles and fish oil! The food itself is made up of larger pieces which is good for my two as it means they actually have to chew it rather than inhale it in one go! The food can also be served with warm water to change the texture (there is a helpful video on their webpage explaining how to do this!). One of the things that really stood out to me is the easy use feeding calculator which tells you the amount the dog should be on for its weight, for example Lily and Sev weigh 5kilos each so if they eat Guru alone they would need 60grams. I feed mine raw food as their main meal and due to the way guru is made they are safe to have it alongside the raw so have been having a small sprinkle mixed in which they love! Overall we think Guru is a fab independent brand with brilliant customer service (they where more than happy to answer my constant flow of questions!) and I would definitely recommend this food! In fact I’m off to go and order some more Field Trip bones ready for the 9th of April!